Zebra 4800 performance resin offers exceptional abrasion and solvent resistance on a wide variety of substrates, while still providing excellent edge definition. 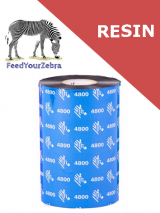 Zebra 4800 series resin thermal transfer ribbons for Zebra industrial printers including Zebra S4M, Zebra ZT220 (maximum length of 300m), Zebra ZT230, Zebra ZM400 and ZM600, Zebra 105SL and Zebra 105SLPlus, Zebra 110Xi4, Zebra 140Xi4, Zebra 170Xi4 and Zebra 220Xi4. A high-quality resin ribbon that offers exceptional abrasion and solvent resistance on a wide variety of substrates, while still providing excellent edge definition. This ribbon is an excellent choice for printing dense barcodes and high-resolution graphics, and will even print on some Zebra topcoated paper labels. Its unique resin base provides excellent resistance to outdoor elements and many chemical solvents.